Following a year-long battle, James Murphy got the all clear today just before going on air. 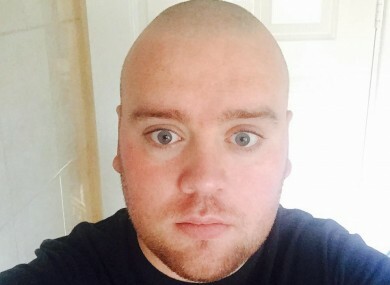 A CORK MAN was left in a state of shock after being diagnosed with a brain tumour at the age of 25 following a weekend of bad headaches. James Murphy from Ballincollig chose to undergo a year of radiation and chemotherapy, along with serious surgery to remove the 4cm cancerous growth on his brain. “I left work in Dublin on a Friday and travelled to Cork. As a typical 25-year-old would do, met his friends for a few drinks on the Friday night and then woke up on Saturday morning not feeling the best,” Murphy told Ryan Tubridy on RTE Radio 1 this morning. Murphy was informed that a man of his age and health should not be suffering from a headache like this and was immediately transferred to Dun Laoighaire hospital for tests. From here, his world was turned upside down. “They found a growth on my brain when they did the scan and what it transpired to be was a tumour on my right parietal lobe, it was about 4cm,” he said. After being given a variety of options to figure out whether the tumour was benign or cancerous, Murphy elected to have a high-risk surgery on 9 August 2016 which managed to remove 95% of the growth. “It came back that the results were cancerous. It came back to be a grade 3 brain tumour. They discussed the future treatment, which in my case would be radiation and chemotherapy,” he said. Following six months of intensive chemotherapy and radiation, Murphy received the results of his six month MRI just before going on air – the first scan he underwent since the surgery. “There was no active cancer present. It looked like the 5% is gone. Obviously with these things you’re never fully out of the woods, they’ll continue to monitor it with scans every six to twelve months,” he said. The cancer diagnosis has left Murphy with a completely new outlook on life with more of an awareness of the support structure he has around him. An employee of Twitter, Murphy also credited the social media company for the outstanding support it has given him since his diagnosis. “They’ve supported me right from day one and that’s not just my colleagues in Dublin, that’s colleagues in San Francisco, in London, in Singapore. “They nominated brain tumour Ireland as their charity partner for 2017,” he said. Brain Tumour Ireland was founded in 2012 to provide information and support to brain tumour patients and their families. THe charity also supports brain tumour research, helping to fund the Royal College of Surgeons in Ireland brain tumour biobank. Twitter Dublin is running a fundraising initiative called Wear a Hat Day on Friday, 12 May. People can donate €4 to Brain Tumour Ireland by texting BTI to 50300 or through the fundraising page here. Email “'I thought it was a hangover, but it was more sinister' - Cork man diagnosed with brain tumour at 25”. Feedback on “'I thought it was a hangover, but it was more sinister' - Cork man diagnosed with brain tumour at 25”.